Chronic medical conditions, such as diabetes mellitus (DM), are frequently comorbid with psychiatric disorders. In people with mental illness and a comorbid medical condition, the term “comorbid” often signifies more than just a coexistence of illnesses, as worsening of a chronic medical illness affects mental illness, and mental illness, in turn, adversely affects chronic medical illnesses. In caring for those with mental illness, it is important to understand this relationship and to have more than just a rudimentary understanding of these chronic medical conditions, their management, and how psychiatric management of patients' mental illness can interfere with management of their chronic medical conditions. Armed with such knowledge, we can better support patients and/or their family members in managing these chronic conditions, reducing complications, and improving quality of life. DM can lead to multiple long-term medical complications, including cardiovascular disease, diabetic retinopathy, diabetic kidney disease, and diabetic neuropathy.4 Risk factors for complications include smoking, overweight and obesity, physical inactivity, hypertension, hyperlipidemia, and hyperglycemia.3 As such, management of blood glucose levels through pharmacologic interventions is not the only important factor in managing diabetes and preventing long-term complications. Many of these risk factors are best managed by behavioral changes, such as changes in diet, an exercise regimen, and weight loss. In fact, behavioral patterns (such as blood glucose monitoring, blood pressure monitoring, and diabetic and nondiabetic medication adherence) are crucial for managing many aspects of DM and preventing long-term complications. DM and mental illness are frequently comorbid. People with DM have higher rates of mental illness, and people with mental illness have higher rates of DM. Here we discuss the relationship between DM and mental health, including subclinical psychological distress related to DM, psychiatric symptoms related to blood glucose derangements and DM medication management, comorbid mental illness, and risks related to psychiatric medications. Additionally, people with DM often experience psychiatrically related symptoms secondary to derangements of glucose levels and side effects from medications used to manage DM. Patients frequently develop episodes of hyperglycemia or hypoglycemia with poor blood glucose management, and this may lead to agitation, confusion, irritability, or anxiety. Additionally, medications used to control DM can have psychiatrically related side effects (eg, depression, anxiety, nightmares, insomnia, agitation, and confusion).5 Although we do not review all of the medications for DM and their related side effects here, we do note that it is important to consider the potential for side effects from these medications when evaluating or treating patients for mental health issues, particularly if patients have had changes in their chronic mental illness with the initiation of new medications to manage DM. Psychiatrists can play an important role in screening and monitoring for pre-diabetes and DM. This is particularly important for patients with severe mental illness in whom the risk of developing DM is higher than average, adherence to treatment for DM is poor, and visits to a primary care physician may be few and far between. It is also necessary to monitor patients on psychotropic medications because they are a risk factor for developing DM. 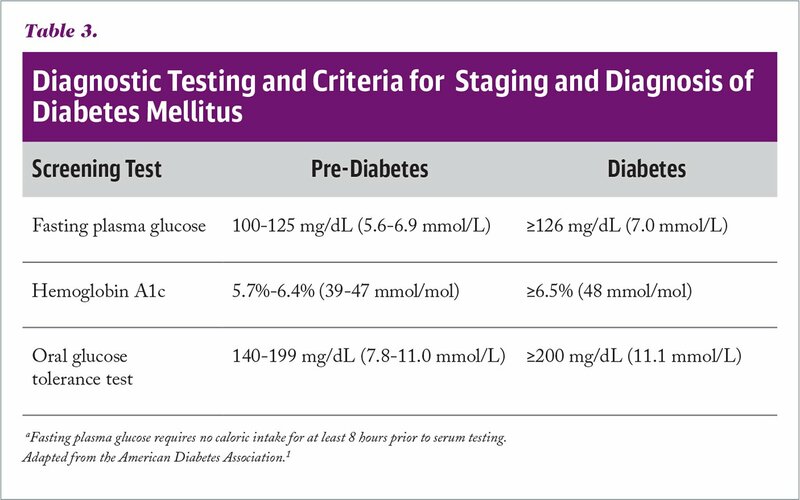 Options for testing for DM include a fasting plasma glucose, a 2-hour plasma glucose value from a 75-g oral glucose tolerance test, or hemoglobin A1c.1 Testing options and resultant diabetes staging and diagnosis are reviewed in Table 3. Like many chronic medical conditions, DM is a disease not just of genetics but one of environment as well; moreover, the risk of developing DM and its subsequent successful management are greatly affected by behavior. As such, successful management of DM and prevention of long-term complications for those with comorbid mental illness necessitates more than just stabilization of mental illness through use of psychiatric medications or therapy that is focused on the comorbid mental illness. Rather, behaviorally based interventions for DM management should be integrated into psychiatric care. The presence of DM and comorbid mental illness is an important topic for psychiatric providers, because they can play a crucial role in a patient's management of diabetes and mental illness. Psychiatric support that is focused on screening, monitoring, and behavioral management of DM may improve a patient's success in managing his or her DM and preventing serious long-term medical and mental-health complications. It is essential that psychiatric providers understand this serious chronic medical condition and its relationship with psychiatric management to ensure early intervention and appropriate management of illness. Wexler DJ, Celano CM, Stern TA, eds. Facing Diabetes: A Guide for Patients and Their Families. Boston, MA: Massachusetts General Hospital Psychiatry Academy; 2018. Centers for Disease Control and Prevention. The National Diabetes Statistic Report, 2017. https://www.cdc.gov/diabetes/pdfs/data/statistics/national-diabetes-statistics-report.pdf. Accessed January 4, 2019. American Diabetes Association. Microvascular complications and foot care. Sec. 10. In Standards of Medical Care in Diabetes–2017. Diabetes Care. 2017;41(suppl 1):S105–S118. doi:10.2337/dc17-er07c [CrossRef]. Goebel-Fabbri AE. Eating disorders. In: Peters A, Laffel L, eds. Type 1 Diabetes Sourcebook. Alexandria, VA: American Diabetes Association; 2013:180–186. United States Preventive Services Task Force. Final recommendation statement: abnormal blood glucose and type 2 diabetes mellitus: screening. 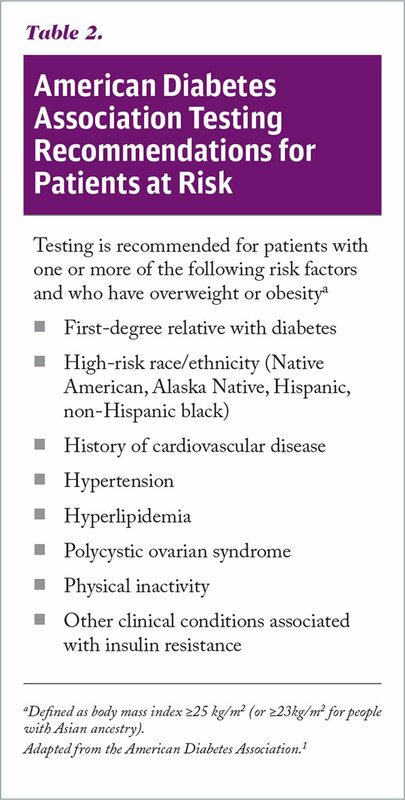 https://www.uspreventiveservicestaskforce.org/Page/Document/RecommendationStatementFinal/screening-for-abnormal-blood-glucose-and-type-2-diabetes. Accessed January 4, 2019. Maria C. Prom, MD, is a Fellow in Consultation-Liaison Psychiatry, Massachusetts General Hospital (MGH); and a Clinical Fellow in Psychiatry, Harvard Medical School. Address correspondence to Maria C. Prom, MD, MGH, 55 Fruit Street, WRN 6, Boston, MA 02114; email: mprom@partners.org.